When you click the MP3 course download link on your receipt e-mail you’ll shortly see a screen similar to below that allows you to OPEN or SAVE. Please choose the SAVE option. The course could take a few minutes to download. 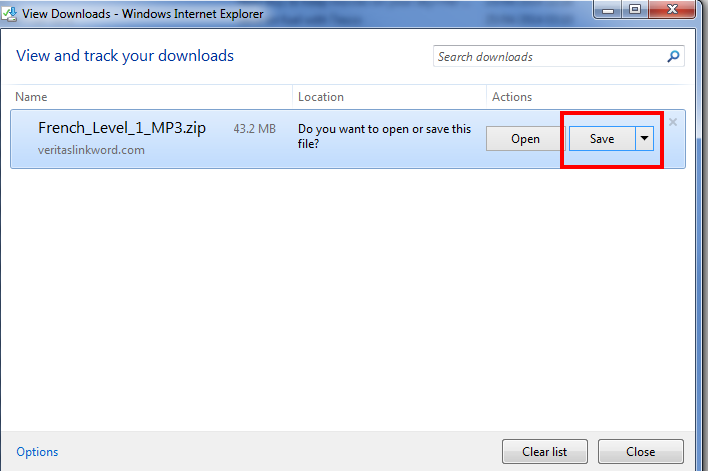 When the course has downloaded, go to the Downloads folder of your PC (or wherever you saved the file to). 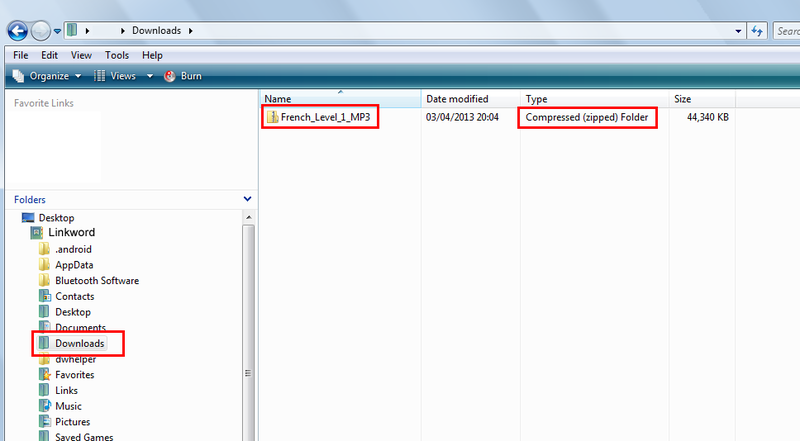 You should see a folder called French_Level_1_MP3 folder as shown below. Please click the images below to see larger versions. Click on the folder called French_Level_1_MP3 (compressed zipped folder) in your Downloads folder and you should see another folder inside it called French_Level_1_MP3 – this is the unzipped folder. 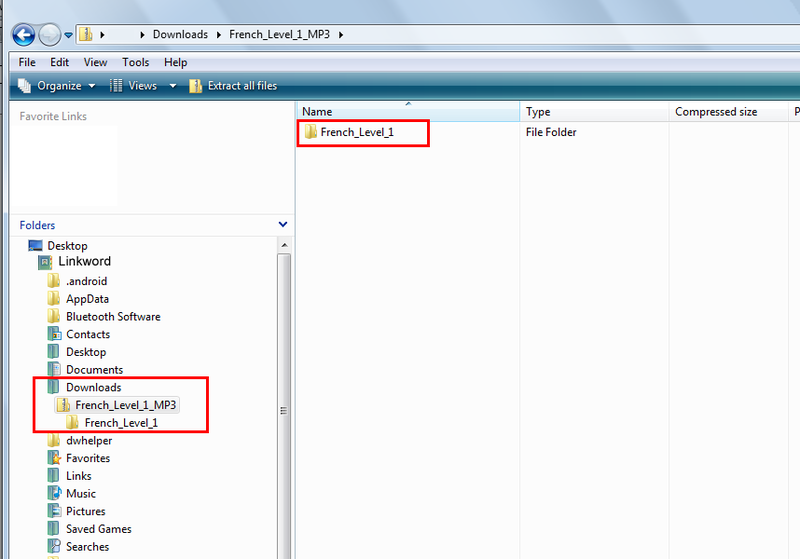 RIGHT CLICK on the folder called French_Level_1_MP3 and choose the COPY option. You can then paste the course folder to anywhere on your PC for use, for example, to the DESKTOP or MUSIC folder. Repeat the process above for other Levels of the course (e.g. French Level 2). Clicking the download link on the receipt e-mail will download the course to your Mac. The course could take a few minutes to download. When the course has downloaded, go to the Downloads folder of your Mac. The folder should be automatically ‘unzipped’ when the download is complete. 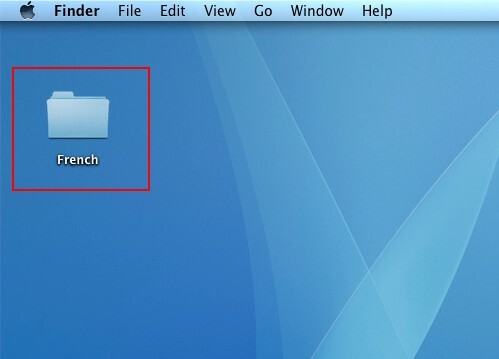 When your download is complete please copy the ‘French_Level_1_MP3‘ (for example) folder from your downloads folder to the desktop of your Mac like shown below.